It was a big night for supporters of ranked-choice voting. Not only did they grab the national spotlight for making Maine the first to use the system in a statewide race, they also appear to have passed a ballot question that overturns the Legislature's attempt to delay and repeal the law voters passed in 2016. The victory will increase chances that the election overhaul will be used for federal races in November and potentially after that. 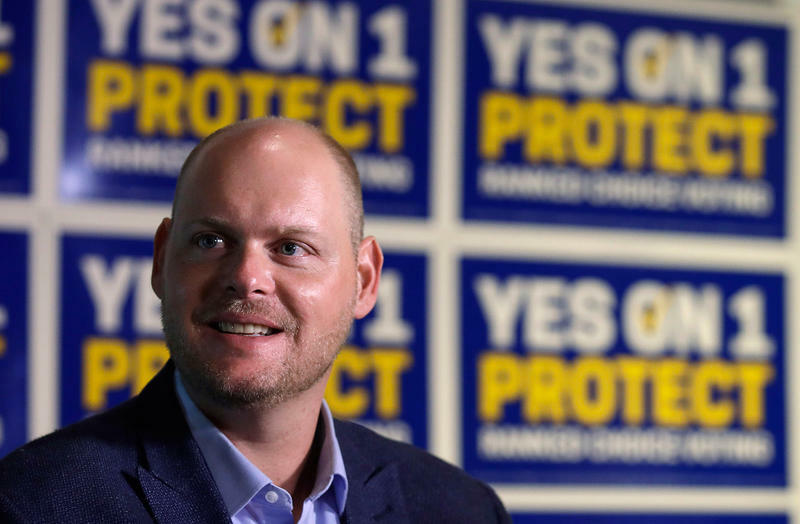 Kyle Bailey took the makeshift stage at the Urban Fermentory and Brewery in Portland shortly after midnight to give a victory speech that was cautiously triumphant. "So the national partner for the Bangor Daily News has called the race for Yes on 1 .... now, I want to be clear there are still thousands of votes to be counted across the state of Maine. And we want to make sure every vote counts." The Associated Press would also call the race for Yes on 1 about an hour later when the ballot question had garnered an eight point lead with 60 percent of precincts reporting. But Bailey and supporters had good reason to be wary of curveballs and surprises. "In November of 2016, Maine people approved ranked-choice voting in the second largest referendum vote in the people of Maine's history, only have the Maine Legislature repeal it in October of 2017," Bailey said. Passage of the delay and repeal law was just the beginning. Not only did Bailey's group have to scramble to organize a people's veto campaign to try and overturn it, they also weathered three separate lawsuits this year, each designed to derail implementation of the law for a closely-watched debut in which voters would rank candidates for the first time instead of choosing just one. And then, there was the wording of Question 1. "After you read it, you have to like, 'what does it mean?' And you have to read it again,” said Gene Plourde, who voted in Bangor Tuesday. Plourde certainly wasn't the only one who found Question 1 difficult to understand. Voters interviewed by Maine Public and responding to social media posts almost universally complained about it. But Plourde said he did his homework before going to the polls. "And ask a few people about it, and you know, figure it out correctly the way I wanted to answer it," he said. During the runup to Tuesday's election, there was a lot speculation about whether the actual process of ranked-choice voting would confuse voters and prompt them to vote no on Question 1. But Patricia Darling-Pena, also of Bangor, said the ballot was intuitive. "I think it's remarkably easy,” she said. "I think a leaflet in the mail could easily explain it for everyone," she said. Tae Chong, a voter in Portland, dissed the ominous buildup to the ranked-choice debut. "If people can get American Idol, how can you not get this? Gimmee a break," Chong said. "Even seven-year old, eight-year old kids know how to do ranked-choice voting. I don't understand what the controversy is whatsoever. We do it every single day," he added. Many other Maine voters, apparently, felt the same way. In fact, the ballot question designed to keep ranked-choice in place for November and beyond outperformed the original initiative that made it possible in several towns. Bailey acknowledged some of those communities. "And those folks are the voters in Ellsworth, Brooksville, Nobleboro, Woodstock, Rangely, Brooksville, Stueben, New Sweden and Grand Isle," Bailey said. As Bailey noted, those towns aren't exactly liberal strongholds. He says he believes there's a reason the bid to save ranked-choice voting overcame tricky ballot question wording and outperformed the 2016 campaign: a desire to reform Maine's politics and anger. Ranked-choice voting was one of four ballot questions approved by voters in 2016. And nearly all of them were changed or repealed by the Legislature, an unprecedented spurning of the historically sacrosanct "Will Of The Voter" mandate. On Tuesday, the voters appeared to strike back.